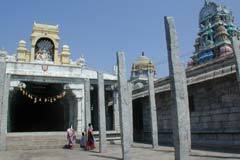 The popular festival of this holy place is conducted in the month of Karthigai on five Fridays and Sundays. This is a glorious occasion when thousands of devotees assemble to participate in the festival. 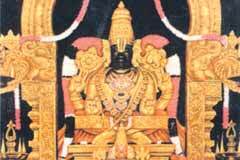 During the month of Chithirai, Brahmotsavam is celebrated for ten days and is well attended. In the month of Vaikaasi -- Nrsimha Jayanthi, Kanchi Garuda Sevai, in Aadi -- Thiruaadipoora Utsavam, Aavani -- Thiruppavithrotsavam, Purattaasi – Navarathiri, Aippasi – Manavaala Maamunigal Utsavam, Maarkali – pakal paththu and raappaththu, Thai – Pongal and in Maasi – Thottaachaaryar Utsam are celebrated. 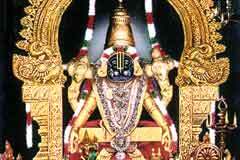 Arulmigu Yoga Nrsimha Swamy Tirukkoil, Sholingar 631 102, Vellore District. The Lord dwells under the Simha Koshtaakruti Dome and blesses us. 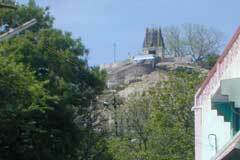 The hill-temple’s length is 200 feet and breadth 150 feet. This is a lovely place spread out in an acre at the height 750 feet with 1305 steps. The belief is that by worshipping this Lord, the problems of mental disability, witchcraft and incurable diseases get dissolved. For conjugal problems, sterility and marriage impediments, the devotees offer prayers and are alleviated from their distresses. People have faith that to offer worship in this sacred place will relieve them from troubles such as loss in business, poverty and sorrow of old age. The unshakeable belief of the devotees is, by piling the stones and building a tower around the hill-path will give them sanction to buy a new plot or build a new house. 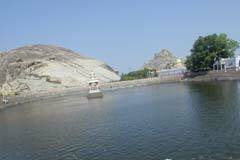 The traditional faith is that by taking a bath in the Nrsimha pond will annihilate a person’s Brahmahathi sin. To perform charitable acts and distribute alms are considered to be equivalent to be doing them in Gaya. Those who pray for issues, those with mental disorder and incurable diseases bathe in the pond and worship the Lord of the hill and Aanjaneyar. 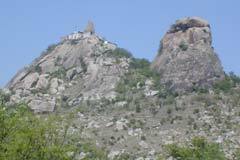 Nearby is another lovely hillock luring the devotees with its natural scenery. 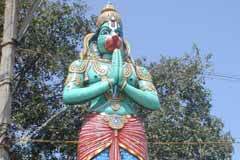 Here dwells Lord Anjaneya who also sits in yoga posture, facing west – his eyes focused on the feet of the Prime Lord. This shrine could be reached after climbing about 400 steps. There is a legend associated with this shrine. Once a king named Indraduymnan came to this place chasing a deer. When he attempted to shoot an arrow at it, the deer disappeared and there came ablaze a flame. From then on he left his hunting activities. He received an extraordinary prowess with which he routed a rakshasa called Kumbhodharan and protected his citizens. It is believed that at the behest of Lord Nrsimha, Lord Anjaneya came to help the king. The former bestowed the latter with the wheel (chakra) and the conch (shanku), and also four arms. Like the Master, Lord Anjaneya also sits in yogic posture, containing within himself, his immense energy. Worshipping this Lord, along with the Prime Deity, drives off insanity and evil doings, is the staunch belief of the devotees. 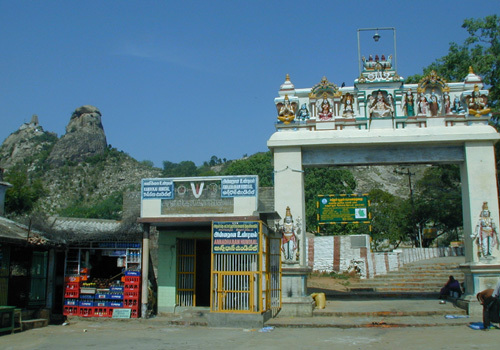 Sholingar, also known as Sholasingapuram or Sholingapuram is situated in the Chennai-Bangalore railway line, 23 kms from Valajapet and 37 kms from Arkonam. 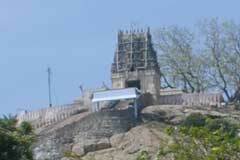 It can be reached by bus from Tiruttani, Chittoor, Vellore and Tiruvellore. 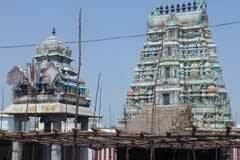 The temple is 12 kms away from the Sholingar station. K. P. Guest House: +91-44-2766 1119, 99945 3228.